It’s that time of year again, and The Legal Genealogist smiles to see all the family historians scurrying around trying to finish up research projects so they can publish family books as presents in this holiday season. Except that this can cause major headaches in a major-league way. He has compiled an extensive family tree right up to the present. Some people have given him their personal info directly, some have provided data for nieces, cousins, etc. and I am not sure whether consent was sought before passing it on to us. Given current concerns about ID theft, I am wondering about legal issues around publishing this data. I’m not sure everyone has been told the information would be published, although those who provided it probably understood the tree would be shared. The permission is sketchier if individuals did not provide the information directly. We are inclined to publish a version of the tree that ends at my grandfather’s era, most of whom died in the 1950s and 1960s. (Uncle Bob) is disappointed, and proposes he provide copies of the full tree on demand, and only in print, with a notation that it is not to be shared digitally. This isn’t so much a legal issue: it’s generally legal to publish accurate information about living people, as long as it doesn’t cause mental suffering, shame or humiliation to a person of ordinary sensibilities.1 And, despite the possible issues of ID theft, simply identifying people as members of a family — children of particular parents and siblings of others, for example — isn’t usually going to cross the legal line. But just because something is legal doesn’t mean it’s right. 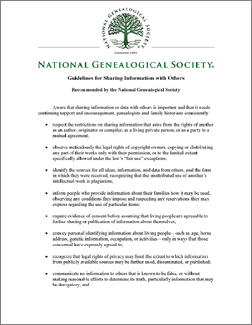 That’s where the ethical issue comes into play — and this is a topic that’s covered again and again in the ethical guides of our field of genealogy. In short, when it comes to living people, we need to tell them what we’re going to do with the information, ask them for their permission to include it, and respect any limits they set on it. Yes, it may be legal to include their information anyway. But let me repeat: just because something is legal doesn’t mean it’s right. What’s right for living people — the ethical default setting for living people — is opt-in: the right way to include living people in our published work is for them to specifically agree to be included. It’s never right to include them without their specific permission after making sure they understand exactly what information is being included and what’s going to be done with it. One caveat: You wrote “it’s generally legal to publish accurate information about living people” but that would depend on your jurisdiction (I know US law is implied, but you have an international audience). In the Netherlands, our Personal Data Protection Act means that in general, you can only process personal information with the person’s permission or if it is necessary to fulfill a contract or execute a law. Strictly personal use is allowed, so you can create your own private tree. Publication would not be strictly personal use so would not be legal without permission. Many European countries have similar legislation. See https://www.akd.nl/t/Documents/17-03-2016_ENG_Wet-bescherming-persoonsgegevens.pdf for an English translation of the law. European privacy rules and laws are much different from those in the United States — and much more stringent. What we can do here would be unthinkable in much of Europe. Hi Judy. I just wanted to let you know that I included a link to this helpful post in today’s edition of UpdatesGenie (http://updatesgenie.blogspot.com/).